Gary Cooper, Grace Kelly, Thomas Mitchell, Lloyd Bridges, Katy Jurado, Lon Chaney Jr.
A town marshal must face a gang of deadly killers alone when the gang leader arrives on the noon train. 1952’s High Noon presents a deceptively simple story. After having cleaned up a formerly wild town, Sheriff Will Kane (Gary Cooper) marries lovely young Amy (Grace Kelly) and steps down from his post. However, just before they split for good, word comes down that the gang of Frank Miller (Ian McDonald) recently came to town,and their recently freed chief will soon arrive. Kane knows they have one objective: to settle the score with him. Kane could run and sacrifice all of the improvements he made, or he could stay and possibly face his own demise. Told virtually in real-time, High Noon focuses on the tensions that grow with each passing minute, especially as Kane attempts to round up a posse to confront and try to defeat the Miller gang. In case you haven't seen the film, I won't discuss Kane's success in this regard, but I will indicate that the story seemed quite unusual for the era. In fact, I've read reports that John Wayne called it "un-American". On the contrary, I think High Noon endorses virtually everything that we'd like to believe is true about the US: a sense of community and a desire by all to stand up for what's right despite the possible personal cost. Because High Noon didn't reveal the American spirit as the Duke wanted to define it, he may truly have felt that it was subversive. I see it completely differently, though, as this is the sort of film that really should inspire apathetic sorts to become more active in their own environments. Speaking of which, the backdrop against which High Noon was made must be acknowledged. It came at the height of the Fifties Communist scare, and writer Carl Foreman was blacklisted for a few years due to his apparent sympathies. High Noon stands as a product of that period and becomes even more compelling when considered against that scenario. This was an era in which few were willing to stand up for what they believed in due to the enormous pressure to follow the "common thought" of the period, and the comparison between the movie and the reality evokes strong similarities. 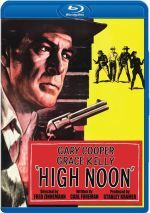 Even without any consideration of historical parallels, High Noon works as a strong and taut piece of drama. Director Fred Zinnemann paces the movie in a terrific manner and evokes every last bit of tension out of the activities. While the film doesn't offer too many well-drawn characters, it at least benefits from a solid cast, with folks like Thomas Mitchell, Lloyd Bridges, and Lon Chaney in tow. From Cooper on down, all offer strong performances. Put simply, High Noon remains one of the rare films that evokes its era but doesn't feel like a prisoner of its age. It provides a deep and satisfying morality play that has barely aged over the last 65-plus years. The movie strongly deserves its status as a classic. High Noon appears in an aspect ratio of approximately 1.33:1 on this Blu-ray Disc. The movie came with one of those transfers that initially impresses but that doesn’t stand up to the scrutiny that high-def invites. The main issue stemmed from the artifacts related to digital tinkering. Noise reduction techniques eliminated much of the natural grain, and even when grain appeared, it tended to be stagnant; we got “frozen grain” that gave the movie an odd feel. Some light but noticeable edge haloes also popped up along the way. Which was too bad, as much of the rest of the image looked strong. Even with the edge haloes, sharpness was pretty good, so most of the movie showed nice accuracy and clarity. Blacks were deep and dark, while shadows showed nice clarity and smoothness. Contrast seemed vivid, and only some minor marks mar the presentation; they’re small and infrequent. Despite those positives, the digital side of the transfer made it a disappointment. As for the film’s DTS-HD MA monaural soundtrack, it seemed suitable for its age. Speech was a little tinny at times, but the lines usually sounded fairly natural when I factored in the era in which they were recorded. To be sure, all dialogue remained easily intelligible at all times, and I noticed no edginess or other problems. Music and effects also showed good delineation. Though the light score never did much to challenge the track, it seemed to reproduce the source material in a more than acceptable manner. Don’t expect great range, but the score and iconic theme song appeared solid. Effects fell into the same range, as they showed perfectly decent replication. These elements were reasonably clean and full, and they lacked any noticeable flaws. Nothing here dazzled, but the audio satisfied. Normally I’d do comparisons to prior editions in this space, but since we got many earlier DVDs of High Noon, I’m not really sure where I’d start. I’ll say this: even with its flaws, I feel the Blu-ray likely provides a stronger presentation than the DVDs. It’s a disappointment relative to what it could have been – mainly in terms of visuals – but it’s still more than watchable. Unfortunately, the Blu-ray lacks most of the extras from the various DVDs. 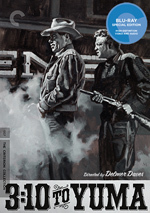 In addition to the film’s trailer, we get The Making of High Noon. Hosted by Leonard Maltin, this 1992 program lasts 22 minutes and 11 seconds and offers a nice overview of the movie and its era. We find then-contemporary interviews with producer Stanley Kramer, director Fred Zinnemann, and actor Lloyd Bridges plus David Crosby (son of cinematographer Floyd) and John Ritter. It also includes some snippets from a late 1950s TV interview with Gary Cooper. In addition to these interviews, “Making” provides some valuable glimpses of the film’s script with Zinnemann's notes written all over them. Overall, the documentary provides a nice discussion of the classic movie that covers a lot of elements in its brief running time. Not only do we learn some details of how the picture was made, but we also receive additional information about the western genre as a whole - especially how High Noon stood out from the pack - and some facts about the "Red Scare". It's a solid little package that will add to your enjoyment of the movie. High Noon holds up well after more than 65 years and stands as a strong piece of dramatic storytelling that also features a powerful social connection. The Blu-ray provides era-appropriate audio but visuals suffer from the overuse of digital transfer techniques that make it less “film-like” than I’d like. We also lose lots of bonus materials from earlier releases. These factors mean the Blu-ray disappoints.